We've included listings for companies such as Plug 'N Save Energy Products and Shutter Shack inside our Plantation Shutters guide. A father and son team joined with two other avid outdoors adventurers to create a company dedicated to designing and producing affordable energy saving products. 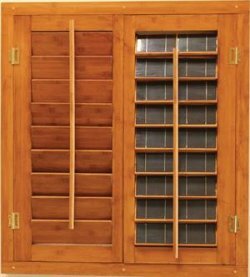 Interior and exterior shutters that harvest solar energy for residential use are their signature product. Evolving from its start as a family-owned custom shutter maker and installer, Plantation Shutters Direct now sells custom wood shutters, wood blinds and plantation shutters nationally. For 25 years, this family-owned company in the heart of Louisiana's bayou country has been working with antique lumber, making it into plank flooring, doors, plantation shutters, stair parts, moldings and unique custom millwork. Among its specialties are antique cypress flooring, and antique heart pine flooring. A Woodmere, NY, retailer since 1970, Shutter Shack also runs a robust online sales arm -- offering radiator covers, exterior and interior shutters, huricane shutters, folding doors, table pads and many other items. Online sales of custom made interior plantation shutters and wood blinds. With twenty years in business, this Dallas company says it stresses product design and quick manufacturing of luxury plantation shutters. Company does installation in its local market, and says it will ship its products anywhere in the U.S.
Florida Blinds & Shutters Inc.
2688 E. Ponce de Leon Ave.